FREEPORT – The office of Freeport Self Storage on Profenno Way is a pretty typical one. The space is well lighted, computers and other electronic equipment are whirring and a fan circulates the air on a hot summer day. What is atypical is the fact that the office is completely disconnected from the Central Maine Power grid. Gary and Kelly Profenno, who own the business, cut the cord with CMP on July 15, making the headquarters of Freeport Self Storage (which also houses Kelly’s Island Girl Designs craft and gift shop) completely self-sufficient when it comes to electrical power. The business and the Profennos’ home are both located side by side, and it’s clear just on the drive up their driveway that alternative energy is in use. A large wind turbine rises up next to the house. The roof of the office, a building that Gary built himself, is covered with solar panels, as is a large section of the home. “They’re everywhere,” said Kelly Profenno of the solar panels that her husband has been installing for more than10 years. Gary Profenno didn’t start out to have a self-sufficient business. He turned to solar power as a solution to a practical problem when he started the business in 2000 – how to run power to his 150 storage units spread out in separate buildings spread across the 17-acre space. Profenno kept on adding solar panels, generating more and more of his own electricity, until one day last year he came to the conclusion that he could run his business without outside electricity. Phil Coupe, the co-founder of Maine Solar Energy in Portland, said most of the customers that he works with turn to solar in an effort to save money, not to completely disconnect from the grid. While he hasn’t worked with the Profennos, Coupe, who has done “tons” of work in Freeport, Pownal and Durham, said that it is “highly unusual” to see someone completely disconnect from the grid in favor of solar power. 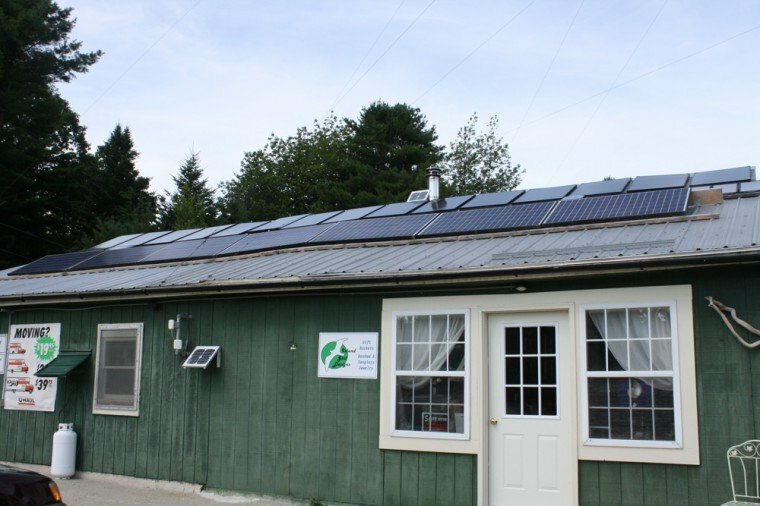 Dana Fischer, the renewable energy program manager for Efficiency Maine, agreed that it’s not common to see people going completely off the grid in favor of solar power. “Ninety-nine percent of solar installations tend to be grid-tied or a grid hybrid where there might tend to be some battery backup,” he said. A spokeswoman for Central Maine Power said the company had no way of quantifying if any other local homes or businesses had joined Profenno and disconnected from the grid in favor of self-generated power. Even though the house, with its wind turbine and solar panels, is still connected to CMP, Profenno said that they are able to generate about 30 to 35 percent of the power they need through solar. The Profennos also heat their house with wood, and the same large boiler also generates heat for some of the storage units located nearby. 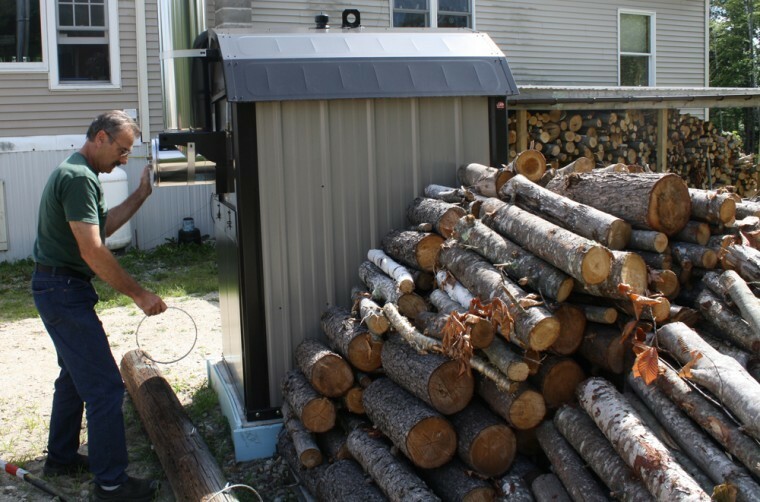 Not all of Profenno’s storage units are heated, but the ones that are use heat generated from the wood boiler to power forced hot water systems, similar to ones used in many homes, Profenno said. The solar power system used at Freeport Self Storage captures the sun’s rays and generates power, which is stored in batteries for use during the night. Those batteries are perhaps the most surprising part of the system. Instead of a high-tech rack of special solar-power storage batteries, the Profennos’ system uses something much more pedestrian – old car and truck batteries, which Gary Profenno said store the power just as efficiently as more expensive batteries at a fraction of the cost. And cost is an issue when it comes to solar power, though Profenno said the prices are coming down as compared to when he began 12 years ago. “On average, panels run between $300-$600,” he said, explaining that a 1-by-3-foot panel cost about $100 when he started installing them 12 years ago, and now he can purchase a larger, 3-by-5-foot panel for $250. When asked how much money he has saved by converting to solar power, Profenno said that right now, he has still spent more than he has saved, though he didn’t have a firm estimate of the total overall cost of the project. But, he said, he believed the solar panels would more than pay for themselves over time, and in the meantime, there are some big advantages to going with solar power. “When there is a storm in the winter, our power will stay on,” he said. Kelly Profenno sometimes shakes her head at the time, effort and money that her husband has invested in the solar panels, but in the end, she said, she’s happy with the results. Gary Profenno said he doesn’t consider himself a “green” person, just “more of a conservative realist. I’m basically trying to set an example that anybody that wants to do this, could do it. “The way our country has been going for the past 50 or 60 years simply isn’t sustainable. We’ve completely become dependent on foreign energy, and I think we can do it here at home with alternative energy and conservation. It needs to be a mix, we need to develop our own resources, but I think conservation and alternative energy is a huge part of that,” he said. 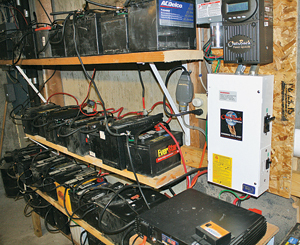 A rack of car and truck batteries serve as the storage units for the electricity generated by the solar panels at Freeport Self Storage.